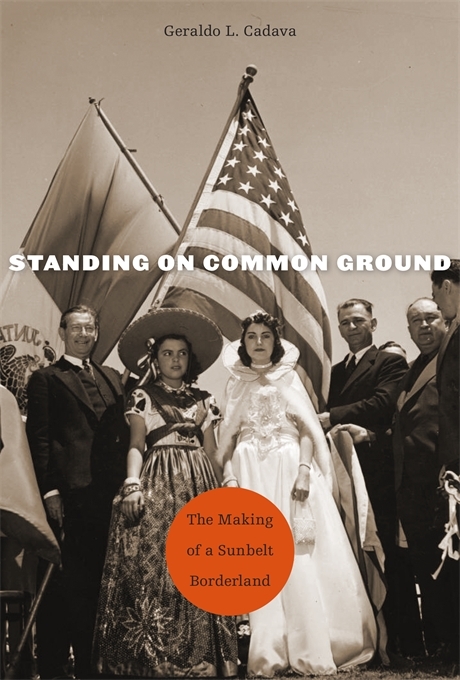 Geraldo L. Cadava’s Standing on Common Ground: the Making of a Sunbelt Borderland is a richly detailed investigation of postwar Tucson and its social, political, economic, and cultural significance to Arizona and Sonora. The author draws on well-crafted case studies of persons and institutions, posing them as emblematic of the region’s larger history and historical relationships. The book is strongest when describing the sociocultural landscape of its host city. Tucson comes alive on the page, and Cadava does an excellent job interweaving multiple narratives into a cohesive story that contextualizes the region’s colonial past within the construction of twentieth-century racial, political, and cultural structures. In this way, the heart of the book is composed of its chapters on the city’s annual rodeo and parade, Jacome’s department store, and student mobilization at the University of Arizona. Each of these stories not only underscores the complex sociopolitical relationships at play in the United States after World War II, but also brings into clear relief the deep integration of the economies in Arizona and Sonora. Perhaps one of the most innovative—and provocative—aspects of this work is the characterization of Alex Jacome’s family retail operation as a kind of modern-day civic mission. Cadava asserts that Jacome proffered Americanized notions of modernity and progress to regional consumers, framing the department store as a space not unlike the colonial missions that were seen as having introduced “civilization” to the area centuries before. He notes that promoters of capitalist modernization repeatedly appealed to a carefully curated vision of the region’s colonial past as a means to promote business interests tied to conservative and anti-communist political messages. Cadava also successfully incorporates Mexican and indigenous voices into Standing on Common Ground. He reiterates the importance that Sonorans played as integral participants in the formation of a binational economy. The Mexican press, largely in the form of the Sonoran newspaper El Imparcial, is well used to flesh out the social and cultural discussion of national identity, political rights, and consumerism in the region. Likewise, Cadava does not overlook the contributions of indigenous communities that stretched across border, ensuring a nuanced appreciation that the history of the borderlands is not simply a binary one, but rather something much more complex. These points came to the fore throughout the work, especially in the discussion of historical memory and public spectacle posed in the chapter on the statues commemorating Francisco Villa and Eusebio Kino. If the telling of a multi-layered history of Tucson described the extent of Cadava’s ambitions, then it can be said he succeeded. Instead, however, he sought to extend beyond this framework, reaching to construct a larger narrative of Arizona and Sonora. In this sense, other cities in this Sunbelt Borderland, and their relationship to Tucson, come less clearly into view. Perhaps, more discussion of Hermosillo and the development of political, cultural, and commercial structures in that city could have provided nice contrasts to the processes underway in Arizona. We are given a good understanding of Jacome’s and the Pioneer Hotel in Tucson, but are also left wondering what were analogous ventures in Sonora. Throughout Standing on Common Ground, Cadava works hard to ensure that Mexican and indigenous voice are heard, but ultimately, these rich narratives play a supporting role to the central story of Tucson, the state of Arizona, and the postwar U.S. political landscape. With that said, this reviewer found Standing on Common Ground impressive in its narrative clarity, capturing a complex sense of many of the historical actors and movements involved. Cadava’s excellent scholarship should remind Borderlands historians that when writing about the region, we must do more than simply acknowledge the other side of our political and historiographical divides. In striving to conceive the border as a cohesive unit, he provides specialists of the United States and Mexico with a compelling chronicle of the continuities and discontinuities that emerge within the formation of historical memory and social and cultural politics of the twentieth century. This is well-written, but too nice, Mike. He focuses way too much on elites, and I felt like he was so interested in painting a rosy picture of cross-border collaboration that ignores the disparities of “development.” If I recall, he tries to address the development issue in the end, but I was left quite unsatisfied. That’s a valid criticism, and the book could have been served if the author had given us more from the people who worked in the businesses he described; for example, examining available employment records or conducting oral histories with former employees. Nevertheless, for what he was trying to do, Cadava raises a lot of compelling points about how to write Borderlands history, connecting distinct time periods together for greater context.